Pot is NOT harmful to the human body or mind. Marijuana does NOT pose a threat to the general public. Marijuana is very much a danger to the oil companies, alcohol, tobacco industries and a large number of chemical corporations. Various big businesses, with plenty of dollars and influence, have suppressed the truth from the people. Did you know, it is estimated that hemp has approximately 25,000 uses? From food, paint and fuel to clothing and construction materials, hemp is used. There are even hemp fibres in your Red Rose® and Lipton® tea bags. And several cars made today contain hemp. The oldest relic of human industry is a piece of hemp fabric (canvas) found in ancient Mesopotamia dating back to approximately 8000 B.C. The oldest surviving piece of paper was made over 2000 years ago in China and was also made from hemp fibre. In 2500 B.C. the pharaohs used hemp in the construction of the great pyramids. Hemp was so important in England in the 16th century that King Henry VIII passed a law in 1553 which fined farmers who failed to grow at least one quarter acre of hemp for every 60 acres of arable land they owned. There was even a time in history for over 200 years when you could pay your taxes in America with hemp. 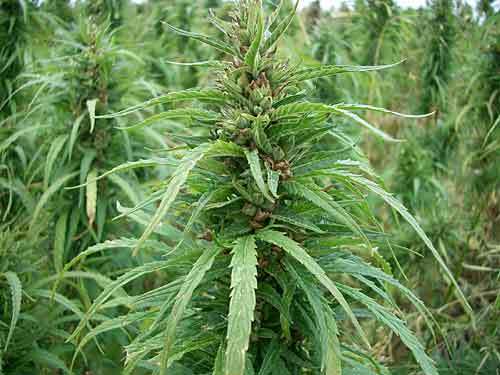 In 1850 there were more than 8,300 hemp farms in the United States. Every 3.6 seconds someone in the world dies of hunger. Hemp seeds are the most nutritious and economical solution to end world hunger. With an 80 percent concentration of "good fats" our bodies need for good health maintenance and protein with all eight amino acids plus optimum dietary fibre, hemp truly is a "perfect balance" food source. Nature has provided the essential nutrients for restoring and maintaining optimal health in a power-packed seed that is gluten, cholesterol and sugar free. 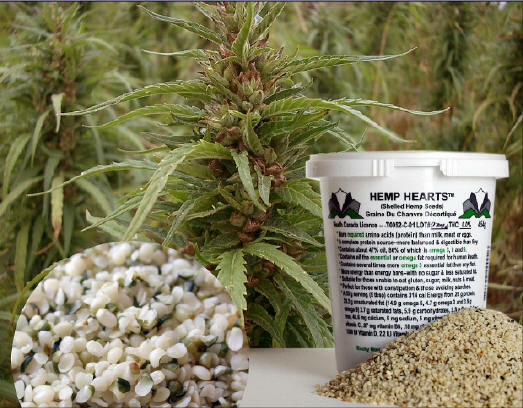 Pure, natural, raw shelled hemp seed - the best single food source of protein, essential fats, vitamins and enzymes on the planet. vitamins and enzymes on the planet. The first diesel engine was designed to run on vegetable oils, one of which was hemp oil. In the 1930s Henry Ford produced an automobile composed of 70 percent hemp plastic which also ran on hemp based fuel and oil. In 2001 the "Hempcar" circled the North American continent powered by hemp oil. The paintings of Rembrandt (1606- 1669), Vincent Van Gogh (1853-1890) and Thomas Gainsborough (1727- 1788) were painted primarily on hemp canvas, often with hemp oil based paint. Over 50 percent of all chemical pesticides sprayed are used in the cultivation of cotton. Hemp is eight times stronger than cotton and more air-permeable. Hemp can grow vigorously (up to 16 feet) in 100 days without the use of harmful pesticides and herbicides... healthier for your skin and the environment. One acre of hemp can produce as much raw fibre as 4.1 acres of trees. Pulping hemp for paper would produce a strong paper that lasts incredibly long and doesn't yellow with age. Also, using hemp as a raw source for paper would eliminate the need to cut down our dwindling old-growth forests which contribute to climate control and clean the air we breathe. * Benjamin Franklin owned one of the first paper mills in America and it processed hemp. Also, the War of 1812 was fought over hemp. 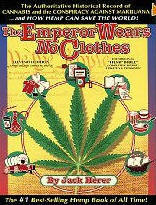 Napoleon wanted to cut off Moscow's export to England; Emperor Wears No Clothes, Jack Herer. * For thousands of years, 90% of all ships' sails and rope were made from hemp. The word 'canvas' is Dutch for cannabis; Webster's New World Dictionary. * The first Bibles, maps, charts, Betsy Ross's flag, the first drafts of the Declaration of Independence and the Constitution were made from hemp; U.S. Government Archives. * Hemp called 'Billion Dollar Crop.' It was the first time a cash crop had a business potential to exceed a billion dollars; Popular Mechanics, Feb., 1938. Certified proof from the Library of Congress; found by the research of Jack Herer, refuting claims of other government agencies that the 1942 USDA film 'Hemp for Victory' did not exist. 'It has a short growing season...It can be grown in any state...The long roots penetrate and break the soil to leave it in perfect condition for the next year's crop. The dense shock of leaves, 8 to 12 feet above the ground, chokes out weeds. William Randolph Hearst (Citizen Kane) and the Hearst Paper Manufacturing Division of Kimberly Clark owned vast acreage of timberlands. The Hearst Company supplied most paper products. Patty Hearst's grandfather, a destroyer of nature for his own personal profit, stood to lose billions because of hemp. In 1937, Dupont patented the processes to make plastics from oil and coal. Dupont's Annual Report urged stockholders to invest in its new petrochemical division. Synthetics such as plastics, cellophane, celluloid, methanol, nylon, rayon, Dacron, etc., could now be made from oil. Natural hemp industrialization would have ruined over 80% of Dupont's business. Andrew Mellon became Hoover's Secretary of the Treasury and Dupont's primary investor. He appointed his future nephew-in-law, Harry J. Anslinger, to head the Federal Bureau of Narcotics and Dangerous Drugs. Secret meetings were held by these financial tycoons. Hemp was declared dangerous and a threat to their billion dollar enterprises. For their dynasties to remain intact, hemp had to go. These men took an obscure Mexican slang word: 'marihuana' and pushed it into the consciousness of America. Sometimes it is only through the pithy insights of a pocket book or manifesto that the world can fully understand an issue. Such is certainly the case with this Cannabis Sativa, as most of the American people - especially the DEA - seem to have trouble understanding the practical value of industrial hemp and the spiritual and medicinal value of its psychoactive sister, Marijuana. I say America, because the rest of the Western World is already catching on (hemp is being grown in Canada in and all over Europe now), whereas China, Japan, and many other eastern countries never forgotten this miracle crop. Yes, miracle crop. Hemp can be put to just about any use: It can be made into wood, paper, clothing, fiberglass, canvas, twine, rope, soap, shampoo, cosmetics, oils, paints, inks, putty, and coatings. It is also perhaps the most important food crop, as it stands supreme as the planet's single most nutritious source of protein and essential fatty acids. It can even be made into auto fuel!! (Visit Colorado's Rocky Mountain Institute's website for information on this long-known property of many carbohydrates.) Moreover, hemp treads much lighter on the planet, as it usually does not require pesticides or herbicides (indeed, it is used as natural herbicide); and its fast-growing roots and self-mulching leaves can even rejuvenate undernourished and eroding soils. In effect, by converting to hemp paper and woods products instead of felling old growth and dwindling indigenous rain forests, and furthermore by using hemp to retain soil composition in areas were erosion is advancing (hemp can grow just about anywhere), we could begin to restore declining ecosystems. Without understatement, hemp could lend a much-needed hand in saving the planet. This book was a real eye-opener. In terms of price, expediency and insight you can't go wrong. Jack Herer has updated his authoritative history of hemp's myriad uses and of the war on this plant, just as it has become high-profile news, with supporters such as Woody Harrelson and Willie Nelson. Herer thoroughly documents the petrochemical industry's plot to outlaw this renewable source of paper, energy, food, textiles, and medicine. Photos, illustrations & charts. 10 tables. shows, with hard data that: pot has absolutely no toxicity to human tissues; pot has anti-carcinogenic properties; the tar, although greater in proportion than tobacco, is completely water-soluble; smoking marijuana shortly after having a stroke prevents the swelling of the brain -- and consequently much of the brain damage and loss of function associated with strokes.